Google Adsense is the most popular advertising program and most loved way of blog monetization. Almost all bloggers and website owners use Google Adsense to monetize website traffic. But Google Adsense is harder to get and very strict to its terms and conditions. If Google finds anything wrong in your website that is not following the terms and condition of Adsense, it will suspend your account and ban you for life time. New bloggers also find it hard to get Adsense account approval. If you are new to blogging and need Google Adsense account, you must read these Adsense account approval tips. Google never give second chance to users. There are many new people who got Adsense and then use some fraud tricks to increase revenue. After few days, they got account ban and then regret. But nothing can be done. In these kinds of situation, they need some other monetization programs that perform well and pay in time. 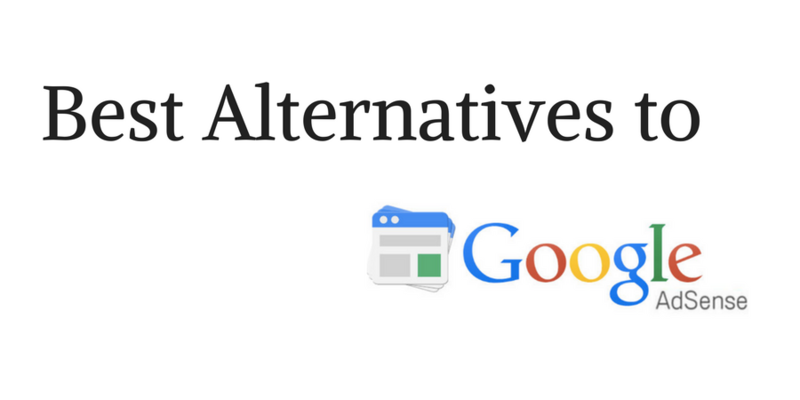 In this post, I am listing few Google Adsense alternate advertising programs which you can use to monetize your blogs. Although these programs are not as good and Google Adsense, still you can earn a decent income. Now when you know the basic details of these ad networks, let’s have a look on these ones by one. Sulvo is one of the best but less known ad network. I also wrote the Sulvo Review on my other blog where I talked about this ad network in detail. This ad network shows high-quality ads and limits the numbers of ads per page to keep page quality high. They approve websites only if there is good traffic flow. So apply if you have at least 2000 daily unique traffic. This ad network pays for impressions and eCPM is higher than most of the other CPM based ad networks. For Indian traffic, I was lucky enough to get more than $0.50 per thousands of impressions. Sulvo pays monthly and minimum threshold is $100. It pays via Paypal or via Wire transfer both. Chitika is a nice advertising program. It always pays in time and minimum payout is $10. You will easily get approval with the new blog too.I personally like Chitika and use it along with Google Adsense. As now, it is a CPM ad network and pays for the impression. Your earning will depend on the traffic and country. If your visitors are from the United States, you are going to earn better. Media.net is another nice advertising program that pays you for the impression and clicks both. This advertising program is run by YahBingbing network and media.net. The only problem with this advertising network is that you need to get approval for all your website individually. Sometimes, it takes enough time. It gives good RPM and earning is also good. Bidvertiser is also a satisfactory ad network that pays you for the click. I used in early days of my blogging when traffic was very low. That time, it paid me good for clicks. As a new blogger when you are not getting approval from other ad networks, you can try Bidvertiser. Minimum payout of Bidvertiser is $10 which is easy to reach. Infolinks is also an in-text advertising ad network just like Kontera. It also converts few words of phrases in content to clickable link ads. Infolinks pays for clicks on ads. Few publisher reported a problem that their account was banned without any reason, but many publishers are happy. I also tried this initially in early days of my blogging, but later I stopped using because in-text ads do not offer a good experience. Minimum payment threshold on Infolinks is $50 for Paypal or $100 for Bank wire. Amazon is one of the largest affiliate programs but it also has an advertising program Amazon Native Shopping ads. It can also be used as Adsense Alternative to monetize your blog if you have traffic from the US. It offers three types of Ads: Recommendation Ads, Search Ads, and Custom Ads. It shows highly relevant product ads in form of responsive ad unit. So, you can place it on your blog to earn money. Adversal is also a good Adsense alternative in terms of good quality but high paying ads. It offers ads in several languages. If your website sees page views of 50,000 per month, you can apply for this ad network. Adversal has a Minimum payout of $20. They pay via PayPal, ACH, Check, or Wire transfer. Exponential is a nice advertising program but for those who have a high volume of traffic. It was popularly known as Tribal Fusion but changed the name recently. It only accepts websites that have more than 200,000 monthly traffic. Although it pays well, small publishers will never be able to use this. VigLink is a different kind of ad network but has potential to improve your website’s earning. It converts your outgoing links to affiliate links. If someone purchases a product by that link, you will earn a commission. You can yourself add affiliate links, but Viglink has thousands of merchants to link and link addition is automatic to maximize your revenue. I personally use this ad network and get good conversion. Content.ad is similar to Google’s Matched content ads. It shows interesting articles to read. You can put it in sidebar or below the main content and earn decent income. They also pay in time and payment methods including Paypal, Wire transfer, Check and local bank transfer. Skimlinks is similar to Viglinks that converts few words of your blog into affiliate links and earn from sales. In this way, it boosts your earning. You can Skimlinks along with any other Advertising network. These are few nice advertising networks that you can use to monetize traffic of your blog. There are hundreds of other ad networks but most of those are very less pay. So, I have compiled this list to let you know what are the best ad networks you can try if your Google Adsense is not getting approved. If you know any other ad network that must be in the list, you can share it with us via comments.